Distinctive lines and very comfortable: belami armchairs and upholstered benches are carefully crafted, decorative pieces of furniture that will retain their value, whether in an elaborate button back leather version or finished in a smooth fabric. The base frame is either oak, walnut or beech in a range of options, from painted in a choice of colours to oiled. Both the cubic armchairs and the benches, which come in different sizes from 90 to 190 cm wide, are perfect for a wide range of seating concepts – from striking single pieces to generously proportioned corner solutions. 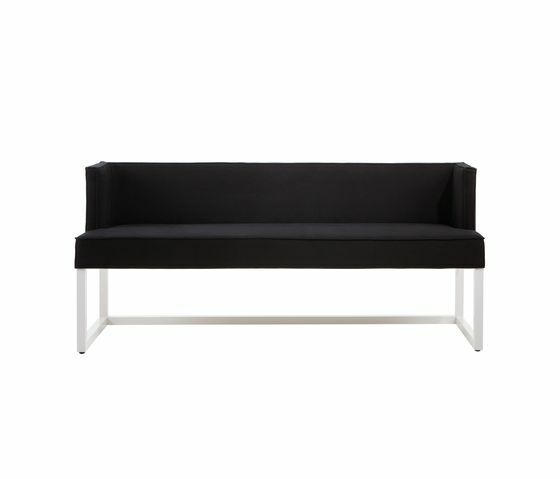 The benches afford additional design options as they are available with either one or two armrests, a corner rest element so you can place two benches at an angle, and of course without armrests. Two benches open at opposite sides placed next to each other, leaving enough space to pass between them, allow diners to leave the table, for example, whilst still giving an overall impression of unity. Covers and stools add individual accents: This arrangement of white button back armchairs and benches around a white dining table looks light and bright, the group of two armchairs and a corner bench in black/walnut at a walnut veneered table looks relaxed and inviting. The button back benches without rest elements are ideal for more open situations, for example as a comfortable oasis of calm in exhibition areas or lounges. They are accessible from all sides and invite spontaneous lingering. Arrangement of six belami armchairs in fresh colours with removable fabric covers in a smooth finish linked visually by the use of white base frames throughout, the white dining table, and their distinctive design. table and bench coated in white in genial conversation with blue covered upholstered bench. Curtain up for something new: This row of four colourful armchairs communicates spontaneity and lends vitality to the room. Three sculptural chairs in white stand in a row along the 2 meter long table, accentuated by an upholstered bench with a black cover. Spectacular arrangements: The benches, from compact to super-long – available in all sizes in between, each 25 cm longer than the last – create intimate or extremely generously proportioned seating zones and an ambience that is characterised by constructive lightness. The models with corner rest elements allow arrangements at right angles.